regardless of where you are in the world. You can hold a social change event at your local school or club, or perhaps hold a music quiz or a games night, or you can invite people to your home for a dinner. 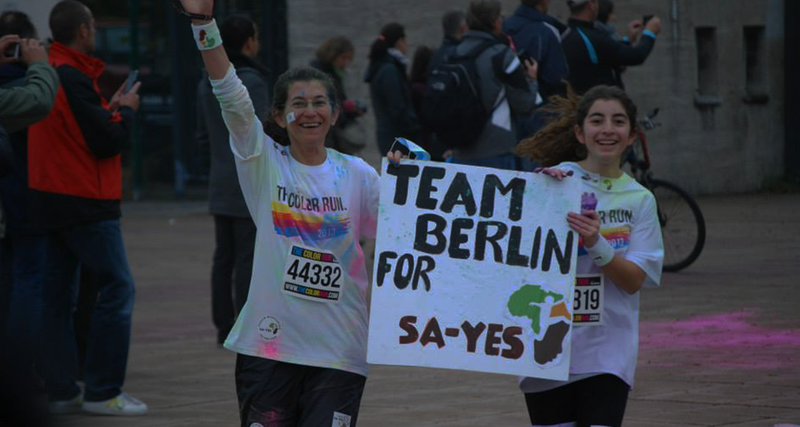 SAYes also regularly hosts fundraisers in New York, London and Cape Town, and takes part in sports events all over the world. If you would like to find out more about fun and innovative ways to contribute, please see the events below or email us at events@sayesmentoring.org for our latest calendar of events. Thank you all for your continued support, and thank you to everyone who has taken part in events in previous years. We really appreciate your generous support. For a great and colourful day out while fundraising for SAYes why not consider The Color Run™. These events are held in cities worldwide. We have had supporters taking part in Berlin, Chicago, Santiago, Colombia and London. Please look at the drop-down menu labelled INTERNATIONAL at the top of The Color Run page and choose your country. If you would like to form a team and run in aid of SAYes we would be very pleased to hear from you. The British London 10K event has been a great success for SAYes over the past couple of years. It is run annually on a route that takes in several of London's famous landmarks. Why not sign up and join Team SAYes. One of our supporters, Nikki Gandy, took part in the LA Marathon in March 2014, and she loved it. If you live in Los Angeles, or fancy a trip, please register and run in aid of SAYes. Maybe you would like to get involved in a charity walk. Arrange something in your country, make it as long or as short as you like, and have fun. We have had supporters take part in walks in London, Belfast, Brisbane, Cumbria, and Spain. If this is something you would like to organise in your city, please let us know. Cologne, Germany hosts a marathon and half marathon each year around September and SAYes has been represented by Sabine Schmidt of Friends of SAYes, Germany. Get in touch to get a team together for the next marathon. See the following links for guides to marathons and half marathons worldwide. If you are running get in touch and we will link you to other SAYes runners. Each year SAYes secures places for the Cape Town Cycle Tour (formerly the event was known as The Cape Argus Cycle Tour). Whether you are a regular rider or a first-timer we would love to have you ride with us. All seeded riders maintain their seeded start times, all others will have a group start. In what began as a race to bring awareness for the need for cycle paths in South Africa, The Cape Town Cycle Tour has become the world’s largest individually-timed cycle race, with as many as 35,000 cyclists taking part. The race route is 109km long, and offers absolutely amazing views of Cape Town and the Atlantic Ocean. (Fun fact - a SAYes cycle shirt was worn in the 2014 race recently appeared in the Cologne Marathon.) Anybody interested in taking part please contact us at events@sa-yes.com. If you know anyone who would like to participate, please feel free to pass this information along to them. We hope to see you next March in Cape Town! The Cape Town Cycle Tour Junior Tours are open to two groups: The Trike Tour for 0 to 6 years for a distance of 1.7km. Junior Tour for 6 to 12 years for distances from 2.5km to 10km. The event is on the day before (Saturday) the main cycle tour. If you don’t wish to run then perhaps cycling, trekking, mountaineering, swimming and a host of other physical activities are more appealing. Events will be found listed on the internet, many organised for those supporting a favourite charity. We welcome event ideas and would like to hear from you. We would love to try to make 2017 our most successful and event-filled year for SAYes. If you would like to get involved please email events@sa-yes.com.